Price: $17.00 Includes Priority Shipping when ordered with PayPal, VISA or Master Card. If you order two copies of Home is the Prime Meridian at the $17.00 price each ($34.00 total), you will receive an additional copy (or, at your request) a copy of Poor Will’s Almanack for 2018 at no charge. Price of $13.00 includes Book Rate shipping VIA CHECK ONLY to Poor Will, P.O. Box 431, Yellow Springs, OH 45387.If you order two copies of this book at the $13.00 price each (check transactions only, $26.00 total), you will receive an additional copy of Home is the Prime Meridian (or, at your request) a copy of Poor Will’s Almanack for 2018 at no charge. 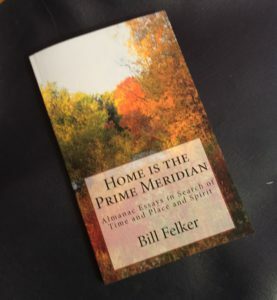 Bill Felker’s HOME IS THE PRIME MERIDIAN: ALMANAC ESSAYS ON TIME AND PLACE AND SPIRIT is a collection of forty-one brief essays taken from the nature column and almanac he has written for regional and national publications since 1984.